Founder of Greenopia, Environmental Therapist, Mom, and Humanitarian. Whenever I host an event, I find myself worrying about the same things. Will people show up? Will the restaurant serve the food on time? In this case, would the heaters provided on the patio at Zazie, the lovely French Cafe in the Haight-Ashbury section of San Francisco, where the breakfast was being held be warm enough? 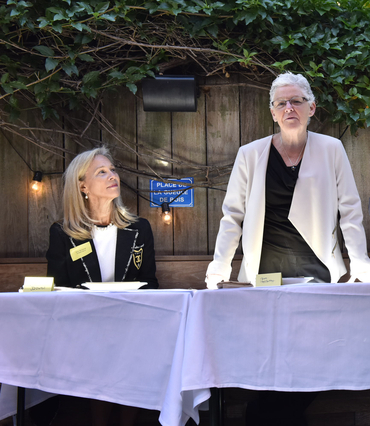 Would the group of twenty-two women my co-host, Zem Joaquin and I had gathered to hear Gina McCarthy, the Administrator for the Environmental Protection Agency of the United States speak be open and interested in supporting EPA's message? But, as someone who has learned to trust the universe, it turns out that if you let it happen, some days can be magical, and this morning ended up being one of them. Gina, first appointed by President Barack Obama in 2009 as Assistant Administrator for EPA's Office of Air and Radiation was confirmed as Administrator for EPA in 2013. Like her predecessors, she inherited big issues and little funding, but was and is devoted to a cleaner and safer environment. One of the first things she did as chief of EPA, was take a long and hard look at their label for safer chemical products, which has been known as The Design for the Environment for the past fifteen years. It's been one of those great programs with little public awareness around it. Gina and her team then spent more than a year collecting ideas and discussing new label options with environmental stakeholders, such as product manufacturers and health advocates. Then they took their concept to consumers and asked what worked best for them. The result is the new Safer Choice label. The most important thing you need to know about this label is that a product bearing it means that ever single ingredient in it has been reviewed by EPA scientists and meets their Safer Choice Standard, which includes stringent human health and environmental criteria. There are more than two thousand products that are currently qualified to carry the Safer Choice Label, many of which are available at your local hardware or grocery store. To make Safer Choice even safer, there is a denotation on the label that helps consumers who prefer products without fragrance, where many chemical toxins are often hidden. Gina's professional story is intertwined with her personal passion and deep commitment to public health and environmental issues. As our group sat on the well-worn wooden benches on the garden patio, sipping coffee, basking in the morning sun and riveted to how and why Gina created the Safer Choice label, I found myself moved. Gina did this in the face of so many cries to defund EPA, because she is a woman who that believes that every human being and animal on this planet deserve to have the right to a toxin-free life. As her personal story unfolded about being a young woman in the trenches of environmental protection, her deep passion resounded with all of us gathered at the breakfast. Amazing what a woman who's slightly over 5'3" can do with a vision! I watched the faces of the women attending the breakfast. The power of Gina's personal story had them nodding their heads in approval. Her words re-connected them to their own story, renewing their "raisin d'être" for doing what they do in the environment and re-committing them to environmental health, both professionally and privately. Although a different setting and over a century later, this meeting reminded me of how it must have been for the women organizing the Suffrage Movement or the women who started Breast Cancer Awareness or Human Rights trafficking or the hundreds of other causes that women gather around coffee or in their villages must have felt as they embarked on changing history. Out of that breakfast gathering on a sunny San Francisco morning, which started with me worrying about the logistics of it all, came the seedling of a new movement. Our group is planning to change history by creating and signing a Safer Choice Pledge, which will promote and support those corporations and companies that are producing products with zero toxicity. Details are soon to follow. For now, if you're a woman (or a man) that believes in a toxin free world and is interested in learning more, please email me at gay@greenopia.com.